Lord Vedapureeswarar is a Swayambumurthy. Rays of Sun God fall on the presiding deity on 13, 14 and of Panguni month (March-April). On all 4 sides (directions) of vimaanam, 4 Nandi are found which represents the 4 Vedas, behind the Shivan sannadhi, Aradhanareeswarar, who is said to be so powerful and special is found, Veda vinayagar is found in a small separate sannadhi. Ambal tirunaamam, is Mangayarkarasi Mangaiyar woman, Arasi queen for all women, this Ambal is said to be the queen and it is evident by worshipping this Ambal, they will get the husband they seek for, during the month of aadi and thai Fridays women who seek good husbands dedicate sarees and taali towards this ambal, sandhana kaapu for this ambal is so special. Bhaktas whose marriage is getting delayed because of chevvai dosham must visit this sthalam to get rid of the dosham, by getting the dharshan of Sri Subramanyar and performing abhishekam will reduce the effect of dosham. One of the tiruppugazh petra murugar sannadhi. This is the fourth sacred Shiva sthalas among the seven where Lord Aiyarappar of Thiruvaiyaru pays His visit during the Chithirai month covering (April-May). Devotees contribute for the renovation of the temple and perform abishek and aradhanas offering vastras to Lord and Mother. Devotees contribute for the renovation of the temple and perform abishek and aradhanas offering vastras to Lord and Mother. The temple is open from 10.00 a.m. to 12.00 a.m. and from 6.00 p.m. to 8.00 p.m.
Sri Vedapureeswarar Temple, Tiruvedhikudi, Kandiyur post-613 202. Tiruvaiyaru Taluk, Thanjavur district. Contact Number +9193451 04187, +914362262 334, 93451 04187, 98429 78302. Lord of the temple is praised in the Thevaram hymns of Saints Tirugnanasambandar and Tirunavukkarasar. 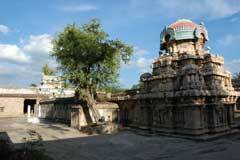 This is the 14th Shiva temple on the southern bank of Cauvery praised in Thevaram hymns. An Asuran grabbed the Vedas from Lord Brahma and went deep inside the sea, Sri Maha Vishnu to the Avathar and got back the Vedas from the Asuran. All the Vedas which were along with the asuras, got the Dosham of being along with them, as a result all the Vedas performed Tapas towards Siva Perumaan of this sthalam, since all the Vedas performed tapas, this sthalam is called as Tiru Vedhikkudi and Siva Perumaan is called as Vedhupureeswarar. 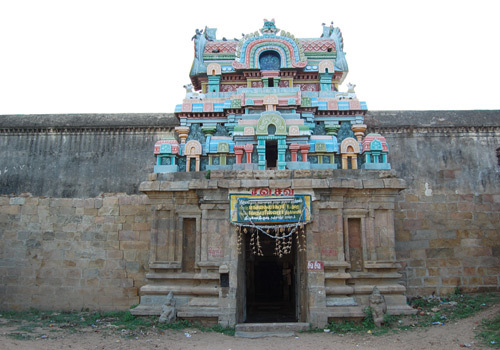 This sthalam is one of the Dosha nivarthi sthalam for marriage, In Devaram, Gnana Sambandar says that this is one of the right temple to visit regarding any doshams in marriage. Sambandar also says that anyone who visits this sthalam and requests for their wish towards the Perumaan will definitely happen. Bhakthas who have marriage Dosham, visit this sthalam and chant. In front of the Perumaan, after that, they by doing abhishekam towards Perumaan will definitely get them a perfect life partner. Once getting married, both the bride and groom visits this sthalam by dedicating their Bhakthi as their wish is fulfilled. Tirunnavukkarasar too says that this one of the Dosha nivarthi sthalam. The temple has a 3 tier Rajagopuram, one prakara with Listening Vinayaka (Sevi Saitha Vinayaka). 108 Shivalinga, Lords Subramania, Dakshinamurthy, Arthanareeswara, Nataraja, Mothers Durga and Mahalakshmi and Sapthasthana Linga shrines are in the inner prakara. There are also epigraphic evidences about the history of the temple belonging to Rajakesari Varman and Koparakesari Varman period. The name of the Lord is shown as Tiruvedhikudi Mahadevar, Parakesari Chaturvedi Mangala Mahadevar. As Lord appeared from the plantain (Vazhai) field, He is also praised as Vazhaimadu Nathar. Pallava kings too had done renovations to the temple. Saint Tirugnanasambandar had sung the glory of Lord in all his hymns. In his pathigam (10 verses) worshipping the Lord of the temple, in the seventh verse, he mentions His mercy on those aspiring an auspicious wedding. Generally, the Arthanareeswara form of Lord Shiva has Shakti on the left. But with a view to give importance to womanhood, Lord is on the left and Mother on the right in the Arthanareeswara form in this Tiruvedhikudi temple. 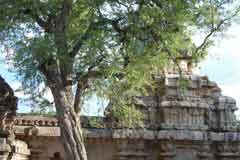 As Lord Brahmma (Vedhi) worshipped Lord Shiva here, the place is named Tiruvedhikudi. Those worshipping Lord Vedapureeswarar will become scholars in Vedas. The four Vedas Rig, Yajur, Sama and Atharva had worshipped Lord in this temple. Lord Vinayaka, enjoying the sound of the Vedas, listened to the recitation by leaning His ears with all attention. He thus assumed the name Veda Pillayar. 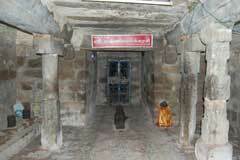 As many scholars well versed in Vedas live here, the place was also once known as Chaturvedi Mangalam. 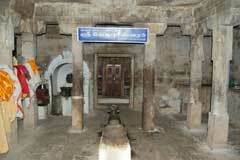 Sun God, Indira, Sage Vyasa and Lord Vishnu had worshipped Shiva in this temple. Surya Puja is performed in the temple on 13, 14 and 15th of Panguni month to Sun God in (March-April). A Chola king was much worried because of the delay in the marriage of his daughter. He came to this temple, worshipped Mother Mangayarkarasi seeking the wedding boon for his daughter. The wedding took place shortly. Since the day, he changed the name of his daughter as Mangayarkarasi as a token of his gratitude to Mother. He also did many renovations to the temple. 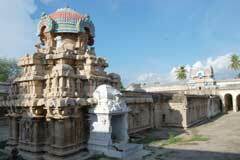 Panchanadeeswarar Temple Tiruvandarkoil , Villupur..
Sri Pasupatheeswarar Temple, Pandanallur, Kukmbak..